Budva is Montenegro’s booming tourist town on the Adriatic, earning it the nickname of “Montenegrin Miami”. With beaches and a vibrant nightlife, you’ll never grow bored living in Budva. Although Montenegro’s tourism took a hit during Yugoslavia’s tragic civil war in the 1990s, things are definitely on the rebound here. Tourists are rediscovering this jewel of a country and that means real estate is hot. 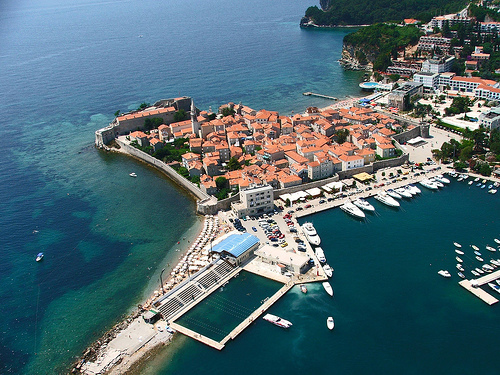 Budva is 2,500 years old, which makes it one of the oldest settlements on the Adriatic sea coast. Thus, with classic architecture to boot (which is Venetian in origin), this town is as scenic as it is lively. The Old Town in Budva has many different tales and stories of its origin. Scholars and Historians believe it to be originally an island, which later joined the shore to form a sand isthmus. Aside from raucous nightlife, the diurnal among you will find plenty to do too. During the summer in particular, there are opportunities to enjoy theatre plays and performances, music events and entertainment programs. But if you don’t have a stomach for the boom and bass of nightlife and partying, this social town might not be for you. Of course, it’s easy for tourists to get in and out, and that makes it convenient for the expat too. Tivat Airport is 20 km (12 mi) away. There are regular flights to Belgrade and Zurich, and dozens of charter planes land daily on Tivat airport during the summer season. Meanwhile, Podgorica Airport is 65 km (40 mi) away, and it has regular flights to Belgrade and other European destinations throughout the year. As for what to see, definitely don’t miss the aforementioned Old Town, Budva Citadel, and Mogren Beach (a more secluded beach near the old town), and get your picture taken with the Dancing Girl Statue. Native people in Budva are known for a rather brusque personality. Shopkeepers usually do not smile or make much eye contact, but don’t take it personally. They’re a bit hardened by the huge tourist industry in town. And let’s face it, you’re here for other reasons than the good service. The climate is sure to treat you a lot better than the people, for instance. Budva has a typical Mediterranean climate, with warm summers and mild winters, and 230 sunny days in a year. Budva comes among the warmest Mediterranean towns with an average temperature of 8°C in January and 27,9°C in July. Interestingly, Budva is referred to as the Montenegrin Kuwait, because of its immense number of millionaires, compared to its small population. Following a real estate boom in 2000s, many native families sold their properties in and around Budva to foreign buyers, mostly Russians, Irish, and Britons. It is now a town with the most millionaires per capita in Europe. It’s definitely a splendid spot for the wealthy. All in all, Budva has a little bit of everything. History, beauty, an international population, beaches, perfect weather, and a happening scene. If it’s your style, you could do far worse than move to Montenegro’s “Budvanska Rivijera”! Looks and sounds like my kind of place!